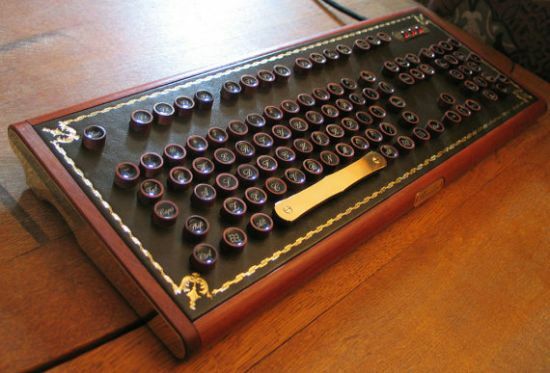 Paying homage to pirates, the “Buccaneer Mk2” is a cool and creative computer peripheral that presents a new take on a Steampunk Keyboard. Featuring the frame finished in solid walnut, reclaimed from an antique dressing table, and a hand engraved “Rampkins” signature brass plate for a classy touch, the exclusive keyboard comes with leather embossed backing and wooden keys to give it an artistic design. Measuring 40 x 200 x 445mm (HWL) in dimensions, the £349 (around $562) keyboard also includes glass rhinestones to cover the status lights that glow as soon as the key board is connected to the computer. Lining the USB cable with black fabric to enhance the retro feel, the Buccaneer Mk2 is a fully functional keyboard to support your regular work while giving a unique design to your system.